Looking for everything under one roof? Greenstone is the perfect destination. 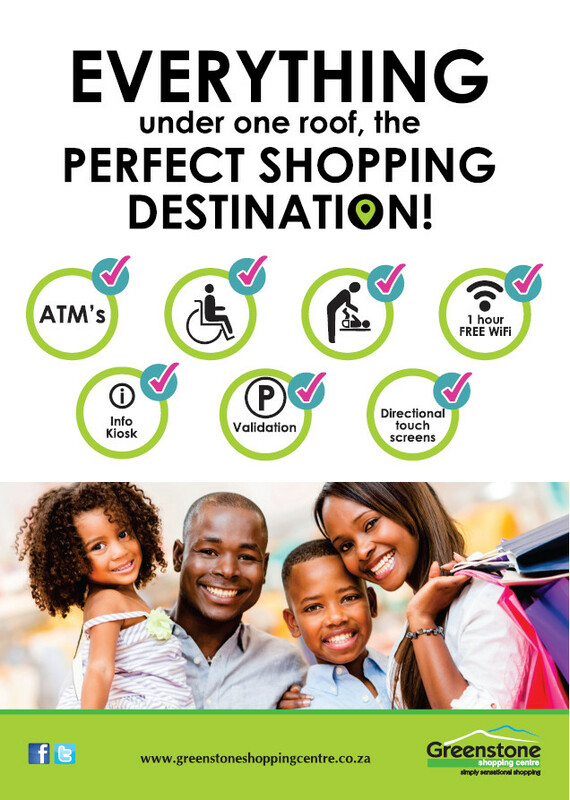 • Greenstone has two Information Kiosks one is on the upper level near Miladys and the other on the lower level near Ster Kinekor. Visitors to our information desks are offered assistance with gift card sales, general queries, store directories, wheelchair and buggy rentals, first aid and centre promotions. • Atms are available in the banking hall at entrance 1 as well as at entrance 7 opposite Pick n Pay clothing and just outside Truworths at entrance 2 to simplify banking for you. Pick n Pay also offers cash withdrawals at their tills and at an instore ATM at the money counter. • Customers have access to one hour or 100 mb free WIFI in the centres common areas. Ensure your wifi is on when entering the centre, Once registered simply login and claim your complimentary access each time. 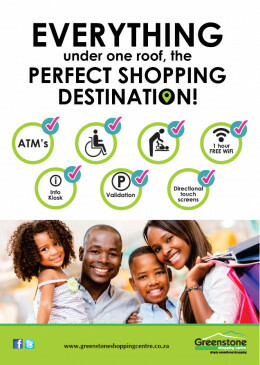 Selected stores and restaurants also offer free WIFI, simply keep your wifi connection on to pickup the various locations. • Centre facilities such as restrooms, walkways, entrances, elevators are all designed to be wheel-chair friendly with specially marked parking bays located very close to the entrances and restrooms allowing for convenient access for disabled visitors. Wheelchairs are available on request from the lower level Information Kiosk during Centre trading hours. Feel free to ask any member of our security staff to point you in the right direction. • Conveniently accessible on both floor levels, our restrooms come with unisex baby changing facilities that offer a comfortable, safe and pleasant environment for parents with babies as well as family rooms for easy to use bathroom facilities for toddlers. Moms and Tots parking is available at entrance 2,3 and 8 with easy access to entertainment stores and either baby product stores.